My initial experience, having had my interest aroused by Fritjof Capra's Tao of Physics, was a brief encounter with the Geddes branch of Yang style Tai Chi in 1984. I enjoyed this, and somehow found it a very natural way to move. But I first studied Taiji Quan, including the martial perspective, with Paul Zabwodski in 1986. This was when I got my first hint of the potential depth of Taiji practice. 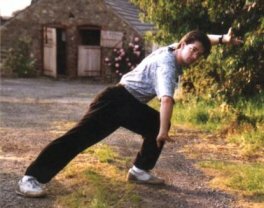 Paul studied Yang style Taiji with Rose Li, and has a broad base in Chinese martial arts; so, whilst my primary study was the Yang style hand form, I also studied Wing Chun's Little Idea Form and a small amount of Shaolin training. Then, in 1988 I moved to Brighton to study Artificial Intelligence and Computing at the University of Sussex, and whilst there I did a little Aikido, including weapon work with the bokken. The Japanese style of weapon training, making extensive use of repetitive drill and short sequences, has continued to influence the way I train and teach Taiji weapons practice. In 1991 my academic studies moved me again, this time to Edinburgh to study Cognitive Science. Initially, I joined a Taiji class run by Adrian Martinez, training in the Beijing 24 step short form and some pushing hands. Then, in mid-1992 I began to study Wu-Cheng Taiji Quan under Ian Cameron. Ian studied Taiji with Cheng Tin-Hung in Hong Kong in the early seventies, and has been teaching in Scotland since returning. He is the founder of the Five Winds School of Tai Chi. In November of 1996 I was awarded an Instructor grade by Sifu Cameron. I have participated at a number of demonstrations for Five Winds Tai Chi over the years. In particular, in 1998 the School was honoured to be asked to demonstrate at the New Year celebrations for Edinburgh's Chinese community, helping to usher in the Year of the Tiger! I was pleased to be chosen by Ian to perform the spear form along with Tadek Klasicki, whilst Sally Munro and Ian performed the sword form. Competition is not at all a major part of my practice, but in October of 2002 I made up part of the Five Winds team competing in the 2nd European Tai Chi Championships in Denmark. Despite sustaining a shoulder injury in the pushing hands heats, I was proud to go on and win a gold medal for my spear form (Spear advanced), having to perform the sequence mirrored, due to the injury, and a silver medal in the restricted step pushing hands in my weight category (Senior Restricted Tui Shou men 90 kg). In total, the team came back with 3 gold, 6 silver and 5 bronze medals, pictured below (I'm standing on Sifu Cameron's right). In 2007, Sifu Cameron made me a Senior Instructor in the system, which qualified me to teach the complete syllabus for the style. Eventually, in 2008, it became clear that it was time for me to concentrate on developing my own classes. I'm always keen to broaden my martial arts horizons; so, whilst keeping Wu-Cheng Taiji as the core of my practice, I've attended a number of seminars over the years, for example with Karel Koskuba in basic Yiquan training, Chen Xiaowang in Chen style Silk Reeling exercises, and Mike Sigman in the fundamentals of internal strength. I've also studied some Xingyi Quan (in particular, the "Five Element Fist") and the basic palm changes of Bagua Zhang. These explorations of other systems inform my Taiji and deepen my understanding of the internal arts. Taking me a little further afield, but still very directly related to my explorations of Taiji as a movement art, I've also completed a foundation course in Dance Movement Therapy at Queen Margaret University. In particular, the practice of Authentic Movement attracts me as a way of reaching deeper into mind/body interaction, and I am a member of an ongoing practice group studying under Fran Lavendel, one of the leading teachers of the art in the UK. I have also been actively involved in a research initiative to explore the connections between Taiji as a form of therapeutic movement and the broader field of Dance Movement Psychotherapy with some of the staff and students at Queen Margaret Univesity. In addition to training and teaching Taiji Quan as a martial art, I am also involved with a number of mental health and community projects around Edinburgh, teaching Taiji Movement for health and relaxation. I have been running a class for the Scottish Association for Mental Health in the Royal Edinburgh hospital since 2005, working with both in- and out-patients using basic Taiji movement skills to help promote healthy embodyment. I also frequently work with the Outlook Project and the Eric Liddell Ca(I)re Programme providing short Taiji courses. My aim in these classes is to promote and strengthen a healthy mind/body relationship, and give some sound relaxation techniques. A more comprehensive list of my work in this field is here. I am registered as an Advanced Instructor with the Tai Chi Union for Great Britain and I have professional idemnity insurance for teaching Taiji Quan through that instructor membership.